It’s all so easy when no one challenges your views. No arguments, no wasted time or energy in the discussion of technicalities, no need to build consensus, no need to defend what you believe, no need to educate others who have differing opinions. No dissension! You have time to get things get done! And, in today’s world, with things moving so fast, especially when one or more crises are brewing (as always seems to be the case), it’s easy to not even listen for any dissension, and easy to justify squelching those who do question or challenge what we have to say. Stones at the base of the Temple Mount in Jerusalem: remnants of the destruction of Herod’s Temple in 70 AD. Delivered at ARK Community Church, Dalton MA, November 2, 2014. The ancient world was a desert, such a wilderness that not even a chicken could be found there. In the year 1, a King James Bible in English, bound & printed in New York (by the American Bible Society) and sold at $1.00, falls to the ground in that desert. The Apostles Peter, John, and Paul run to grab that Bible & organize the Primitive church, which was exactly like our church. Things were marvelous because the Apostles did things exactly as we do. In the year 100 the Devil came in and upset and corrupted everything, then went on to set up the Pope and later (much later) the Tea Party. The Pope plays all sorts of dirty tricks to make money. The Tea Party spends all sorts of money to play dirty tricks. In 1520, Martin Luther finds a Bible in chains, translates it, and the Bible spreads like butter on bread. In his barn in Rome, the Pope gets mad and swears to get even. In 1536, John Calvin comes in and organizes the UCC. Since he was intelligent, he must have thought exactly as we do in everything, and so did everything just as we do. The evidence of this is found in his two volumes of Institutes. Lord, let it be your voice that speaks through my mouth, and let our hearts and minds be open and receptive to hearing the Word you have for us here, today. Amen. At about the time Micah began his prophetic ministry, Samaria in what is now Northern Israel was conquered and destroyed by the Assyrians – in the year 722 BC. This was a sudden and dramatic reversal from the situation just a few years earlier, when both Judah and Samaria prospered and seemed relatively secure. Judah survived, but at a huge cost: a loss of independence, forced to pay heavy tribute to the Assyrians, and the corruption of its faith through the forced incorporation of Assyrian deities and practices. The situation in Jesus time was little better: Israel was again subservient to a foreign power, in this case the Roman Empire. Independence was again lost, ruinous taxes & tribute returned, and the Leaders of the Jewish faith struggled to maintain the independence and purity of their faith against Roman influence and practices. Fortunately, the Jews had, for the moment, under the guidance of the Chief Priests and Sanhedrin, succeeded in preventing the forced introduction of Rome’s civic religion with its idols into the Temple. But, unlike before the arrival of the Romans, the average Chief Priest was now in office for just a couple of years. The position had become a political football, to use a modern metaphor. Most High Priests were replaced when a new favorite surfaced, or when they incurred the displeasure of either the Romans or King Herod and his family. One of the longest serving was Ananias, who was in office for 9 years before being deposed by the Roman Procurator Gratus, and even then, 5 of his sons followed him; as well as a son-in-law, named Caiaphas, who reigned for 18 years. 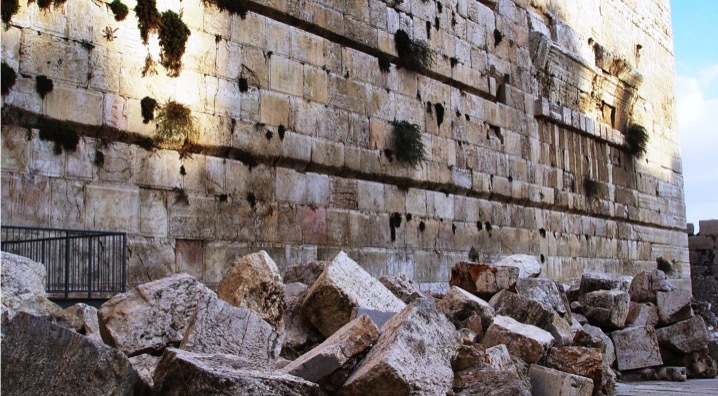 From the Gospels and many other ancient writings, we know that Jerusalem during this period was a hotbed of intrigue, plots, political maneuvering and fear of the mob. So, in addition to their duties as the people’s highest religious authority, and having the central role in the Temple’s most sacred ceremonies, the High Priests had to navigate this minefield of competing parties, theologies and peoples. For the High Priest, failure meant the possible destruction of the Jewish nation and the Temple; at the very least a loss of personal position and power for him and – just as importantly – his family; and quite possibly his own death. In this morning’s reading from Matthew, Jesus recognizes and appreciates the challenges the leaders of the people face when he says to the crowds “The scribes and the Pharisees sit on Moses’ seat; therefore, do whatever they teach you and follow it…” Jesus knew that the survival of Israel was at stake, and that those in leadership had good reasons for the things they taught and told the people to do. Moses’ seat was never a comfortable one, not even for Moses! But, there is a fallacy that almost always operates in the hearts of those who have power: the fallacy of assuming that their good is synonymous with the good of all. Or, to put it another way, that the people cannot survive and prosper unless the current leadership is also surviving and prospering. Preservation of the current leadership is seen as being the same thing as preserving the nation, and, in the time of Micah and of Jesus, even that overwhelming concern is corrupted by the wealth and additional influence available to those who not only preserve their own positions, but please their foreign masters at the same time. A corollary of their predicament is that they needed to look the part. We need to emulate our masters to please them. If we are to lead, then we have to look like we are leaders, successful leaders. If we are to be seen as valid and successful, then we need to dress for the part. Externals become an important part of the game, but also an unconscious admission that despite being a High Priest, or a member of the Sanhedrin, or as a prophet, we fear becoming powerless if we lose the favor of our foreign masters. Yes, we may be teaching and leading as we are called to do, and even honorable in our intentions, but the voices of those who are not of God, and our desire to preserve our own position and influence, drown out the voice of God. We will hear only ourselves, and our worldly masters. But consider this: Jesus’ primary focus is not upon the morality or competence of the leaders of the time. If it were, he would not have exhorted the people to follow what those leaders were saying. Instead, his focus is on those who follow: the average person in the streets, us. Jesus is addressing the crowds when he says this, not the leaders of the people. He is saying that the basis for our own actions and faith cannot derive from others, not even from the guidance of those who lead. Instead, our primary guide must be our Creator in Heaven. We are to call no one “Father” except our Father in Heaven. We have only one teacher, the Messiah. We must hear the voice of God for ourselves. Jesus’ condemnation of the Scribes and Pharisees is about us, not them. They love to be called Rabbi, he says, “but you are not to be called rabbi, for you have one teacher, and you are all students.” – All are students, not just the crowds at his own feet there in the Temple. This in turn reminds me that we are the role models for those newer in the faith than we, and for the generations that will follow us. We are therefore leaders, too. If we forget this, then we risk succumbing to the same temptations of pride and position that challenged the audiences of Micah, and of Jesus, and of Matthew, and of Paul. Like them, we are challenged with questions about what rules to observe if we want to live in faith. We are challenged in attempting to live up to the things we say we believe, and which we expect those we lead to believe, too. And there’s another point: we are responsible for our leaders. Even in Jesus’ time, it was recognized that those who govern cannot do so without the consent of the governed. If this had not been the case, then Herod, or the Emperors in Rome, would not have built such great coliseums or lavished such huge sums of money on spectacles for the entertainment of the masses, nor worried so much about whether there was adequate food and water for the masses of poor in the cities. Nor would they have periodically nearly bankrupted themselves through giving generous bonuses to the legions loyal to them. Throughout the Gospels we see the Scribes and Pharisees, the Sadducees, Caiaphas, Herod, and Pilate all worrying about the reactions of the people to Jesus’ actions and how their own responses to Jesus would be perceived. Squashing dissension as soon as it, or the potential for it, is detected, becomes a paramount concern. And eventually, the simple goal of maintaining ones’ power becomes the sole goal rather than even, as it was originally, a means to the preservation of the people and faith. Paul is the counterpoint to all this, not condemning others, but emphasizing how he leads, and how we should all lead. In our reading from 1 Thessalonians: he says that he believes himself to be responsible to the people for his own conduct as a leader, saying: “You are witnesses, and God also, how pure, upright, and blameless our conduct was towards you believers.” This is a clear statement of how to be a leader: never forget that in the end, you are judged by your conduct towards those who are under your care, not by the power or position or wealth or influence you accrue to yourself. The world is full of challenges: challenges to our position, challenges to our faith, challenges to our very survival. But, what matters is not whether we survive the challenges on our own terms, what matters is whether we hear and respond to the voice of God. We are called to challenge ourselves into letting go of the fear of loss of privilege, of loss of position, of loss of influence, and even the loss of our lives, so that we may walk more closely with our Creator. Walking with our God is challenging enough without allowing the cares and concerns of this world to distract and overwhelm us; for when we do, we are lost. And so, in this election season, consider this: yes, it is easy enough to follow in the steps of Micah and Jesus to condemn the moral blindness and self serving dictates of our leaders. But, since we are responsible for them and the quality of their governance of us, what votes do we need to cast, what challenges do we need to raise, what others do we need to allow into the conversation, and what words of theirs – even if we disagree with them – do we need to consider with care, for the voice of God to be heard?